More than eight hundred people from all walks of life took part in an 8km Health walk to commemo-rate the 70th anniversary of the founding of the World Health Organization. The event was held in Dakar, Senegal on Sunday 26 August on the eve of the WHO Regional Committee, which is the annu-al meeting of Ministers of Health from the WHO African Region. Organised by the Ministry of Health and Social Action of Senegal and World Health Organization, the aim of the Health walk was threefold: (1) To raise awareness and profile of the work and goals of WHO and the Senegalese Minister of Health and Social Action (2) To engage Regional Committee delegates, and residents of Dakar in a celebration of WHO’s 70th birthday. (3) To participate in the global movement to promote health and particularly physical activity as part of a healthy sustainable future. The event was open to people of all ages and it attracted Ministers of Health from other African countries, delegates of the Regional Committee, Members of the Diplomatic Corps, staff of the Min-istry of Health officers and personnel of the various security agencies. The walk, titled “Walk the Talk” began and ended at the Place de l‘Obelix with the WHO Director-General Dr Tedros Adhanom Ghebreyesus, Dr Matshidiso Moeti, WHO Regional Director for Africa and Senegalese Minister of Health and Social Action, Mr Abdoulaye Diouf Sarr stressing the im-portance of a healthy lifestyle. Speaking to a packed crowd at the Place de l‘Obelix, Dr Tedros said: “I would like to thank Senegal for hosting the Regional Committee and for organizing this event. Physical activity is important to beat noncommunicable diseases (NCDs). 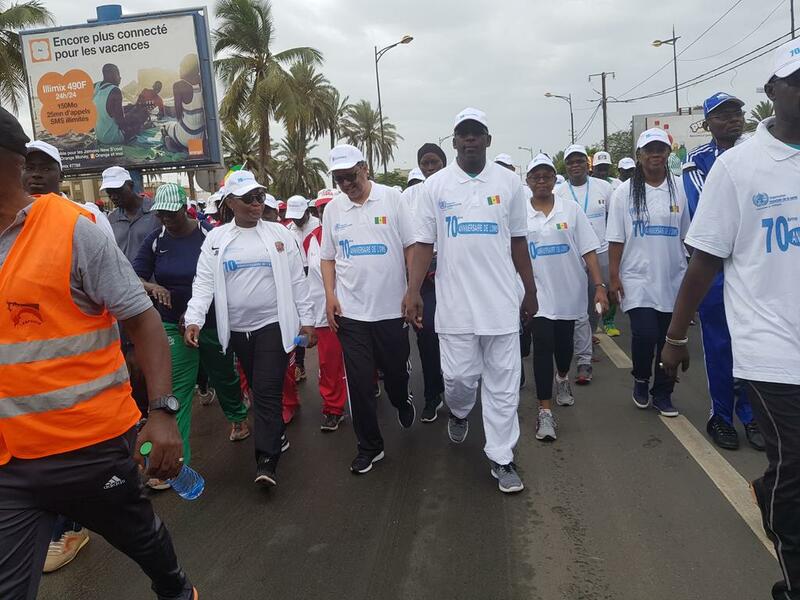 We expect and hope that Senegal will continue to make it a nation-wide wide movement.” He called on other Ministers of health taking part in the walk to or-ganize similar health walks in their respective countries. Senegalese Minister of Health and Social Action, Dr Abdoulaye Diouf Sarr said: “I would ask all Sene-galese to make walking part of their daily routine. Today in Senegal, there is this tradition of walking which has become an institution”. The WHO Regional Director for Africa, Dr Matshidiso Moeti drew attention to the rising problem of cardiovascular diseases, cancers, chronic respiratory diseases and diabetes which pose a serious threat to human health and development. “If nothing is done, Africa's development and the future of its daughters and sons will be compro-mised. I encourage you to make regular physical activity a daily routine and urge you to educate your families and friends to protect themselves by adopting the prevention methods and advice given by health professionals. WHO remains committed to helping you in this area,” she said. The WHO Regional Office for Africa was established nearly seventy years ago. The 70th anniversary of WHO in 2018 is an opportunity to mark the achievements of the past 70 years in health. This event is part of a series of activities taking place across the world.